Today I'm drinking Joe's Premium American Pilsner brewed by Avery Brewing Company in Boulder, Colorado. On the can, I guess that is Joe's mug shot on the front. He's all gangstered up and ready to brew, apparently. Around the rim, the can states "THIS AIN'T YOUR GRANDPA'S PILS." 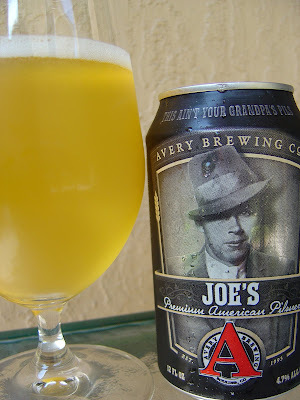 The story on the side goes on to say, in part, "Joe's is beautifully bitter and dry with an abundance of floral, Noble German Hops. Uber-sessionable. Utterly American." Grainy corn and lemony aroma, hoppy. Sharp hoppy citrus bitterness right from the get-go. That initial bite is tamed by some sweeter grains. Crisp, nice strong carbonation. What was nearly balanced then turns again to a grassy and quite bitter finish. The 4.7% alcohol was not noticeable. Decent with no bad pilsner flavors. Sure, pick one of the three hot days Colorado has annually and check it out! I think this is a great pils. I see many of these being had this coming summer. Yep, and very refreshing. Nice bitter twist in there.